In fact, I did ask it. According to the highly unscientific poll I took of my Twitter followers, Max Scherzer is an extraordinarily popular answer – and for good reason! Over the past four seasons he’s posted a 2.95 ERA, 2.90 FIP, averaged 263 strikeouts a year, and won two Cy Young Awards. You could also make cases for guys like Chris Sale, Corey Kluber, and the always underappreciated Johnny Cueto. For any of those pitchers to be the second-best pitcher in baseball, though, they’d have to surpass the guy who generates exceptional results while commanding what I might argue is the most jaw-dropping starting pitcher repertoire we’ve ever seen: Noah Syndergaard. There’s a video-game performance quality to what Syndergaard does on a baseball field that I’m not sure we’ve seen since Barry Bonds retired. We’ve had elite players, sure – Kershaw and Mike Trout are pretty dang good, after all – but there’s a real “this shouldn’t be humanly possible” quality to Syndergaard’s pitching. Projected standings in December have little value beyond serving as a conversation starter. By our depth charts, remaining free agents are still projected to accumulate more than 50 WAR this season. Consequently, projected standings will continue to change over the rest of the winter as more signings and trades occur. As I said, though, they’re good conversation starters, and one of the more interesting conversations they’ve started this winter revolves around whether or not the Angels might actually be good in 2017. As things stand right now, the Angels are projected to go 85-77 and finish second in the AL West behind the Astros. Not only that, but those projected 85 wins represent the fourth-highest projected total in all the American League. Does that mean it’s time to start printing up postseason tickets in Anaheim? Of course not. It’s possible, however — even in the middle of the offseason — to get a sense of current roster strengths and weaknesses from the depth charts that appear here. That’s true of every team. Take a look at the Angels’ depth chart, for example, and you’ll find that they’re doing A-OK in center field thanks to Mike Trout, but that left field is a bit of a weak spot due to the comparatively limited projected production of Cameron Maybin. That’s certainly a conclusion which passes the sniff test. However, even the use of projections to diagnose roster weaknesses can be misleading. The Angels’ starting rotation currently profiles to finish almost exactly in the middle of the pack among major-league teams — 16th out of 30 — which would represent a significant improvement for one of the league’s worst rotations of the 2016 season. While noting this potential for improvement, though, it’s important to recognize the unavoidable potential for deception in assigning one clean, round number to projected numbers — numbers, that is, which disguise an inherent degree of uncertainty. If Garrett Richards, Matt Shoemaker, and Tyler Skaggs are healthy and productive then, sure, the team is in good position to field an improved starting rotation. As Jeff Sullivan pointed out at the start of the offseason, however, all three of those pitchers carry significant health question marks. With Chris Sale now employed by the Boston Red Sox and Adam Eaton preparing for a season with front-row tickets to the Presidents Race, there can be no question about the current objectives of the White Sox. The stars-and-scrubs strategy they’ve employed for the past few years can now be viewed as an abject failure as the team revamps and retools by cashing in those aforementioned stars for players like Lucas Giolito, Reynaldo Lopez, and Yoan Moncada, who figure to be key future contributors. The term “fire sale” is a bit cliché, but it’s undeniable that there is an “everything must go” sense of urgency to what the White Sox are currently doing. Which means it remains likely that Jose Quintana’s days in the South Side are likely numbered and first baseman Jose Abreu may soon be out there door. If you’re placing odds on White Sox players likely to be traded in the near future, however, none will have higher odds than third baseman Todd Frazier. The power-hitting Frazier is entering his final year of arbitration and will be 31 years old when Opening Day rolls around. According to the arbitration projections run by Matt Swartz at MLB Trade Rumors, Frazier is likely to command a salary next year in the ballpark of $13.5 million. Over the past three seasons, Frazier has hit 104 homers – a figure that is second only to Josh Donaldson’s 107 among major-league third basemen. His ISO (isolated power) since 2015 is .241, or just a shade above Kris Bryant’s .238 ISO. Securing the services of a player with that kind of pop to man the hot corner on a one-year, $13.5 million contract would be an absolute coup in the free-agent market, but will the White Sox be able to convert that into a decent return in the trade market? Around this time of year, the free-agent and trade markets begin to feel like stacked dominoes – one domino falling sets many more in motion. The big domino to fall yesterday was, of course, Chris Sale’s trade to Boston. It’s only natural to wonder what the fallout from that trade will be. The Nationals were reportedly very interested in Sale: Will they look elsewhere for elite rotation help now that he’s no longer available? Other teams still said to be interested in top-of-the-rotation arms include the Braves, the Astros and even the World Champion Cubs. (I’m still practicing adding that “World Champion” qualifier on the Cubs. It hasn’t stopped looking weird, has it?) As long as teams continue to look for elite starting pitching, one name will continue to be thrown around: Chris Archer. Now that the Red Sox have added Sale and are clearly attempting to build the American League’s “team to beat,” is the time right for the Rays to finally pull the trigger and deal Archer? Archer and Sale are six months apart in age and both under contract for just under $40 million, but Archer’s contract includes team options for the 2020 and 2021 seasons. Sale’s contract, meanwhile, expires after the 2019 season. So, for essentially the same amount of money a club can acquire either three years of Sale or five years of a pitcher who has been nearly as good. Consequently, Archer’s contract provides — to use the hip lingo — more surplus value. In fact, due to those extra two seasons Jeff found that “Chris Archer’s surplus value is 152% of Chris Sale’s surplus value.” The White Sox just pulled in a player who has previously been listed by some publications as the No. 1 prospect in the sport. If the Rays can reasonably command an even higher asking price for Archer, then, at the very least, they have to be listening to offers. The Best Available Free Agent: Cespedes or Turner? It’s no secret that position players are the big prize in this winter’s relatively weak free-agent class. Available top-tier starting pitching is essentially non-existent, but there are a few hitters who will be expected to be a big boon to their new teams. Even then, though, it’s not as if the ranks of available hitters are dripping with star-level talent. I keep going back to free-agent rankings ordered according to 2017 projection systems – here’s our free-agent depth chart and here are MLB.com’s projections – and grappling with the name atop the projections: Justin Turner. Is it actually possible that a 32-year-old infielder coming off his first major-league season as a full-fledged starter is the game’s best available free agent? Should Teams Believe in the More Selective Cespedes? Baseball players are human beings and – here’s some bad news about the human race – human beings are flawed. Perfection in human form does not exist and, consequently, neither does perfection in baseball-player form. The greatest players the world has ever known still have weaknesses on the field (and off it, for that matter). Some weaknesses are unfixable – sorry, Ben Revere, but you’re never going to be a power hitter – but some weaknesses can be addressed. Players who make improvements can elevate their projected value, which can come in handy during free agency. This year, one free agent who has answered questions about a long-standing perceived weakness and stands to benefit financially is Yoenis Cespedes. A year ago, Cespedes underwent a power surge. He’d always been a 20-homer guy, but, for the first time, he crossed the 30-homer threshold. He also set a career high in isolated power (ISO) with a .251 mark that ranked 12th among 141 qualified hitters. 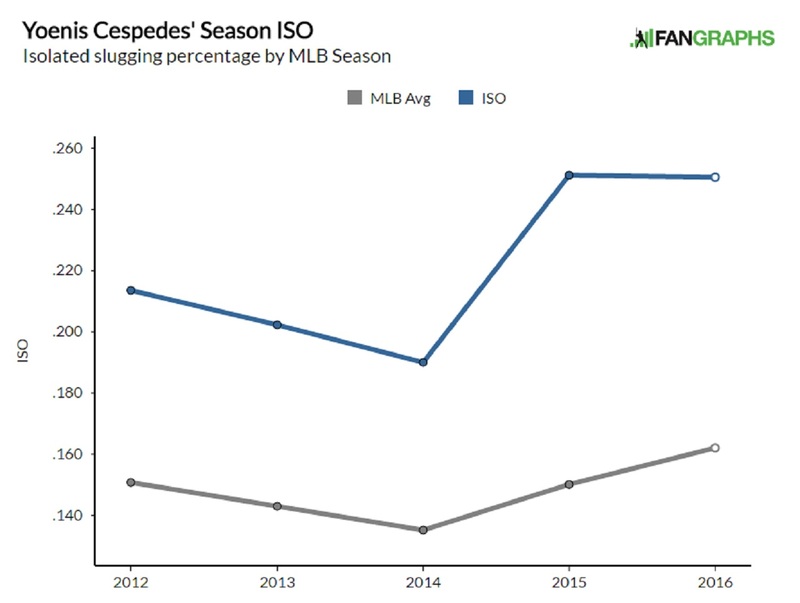 The great news for Cespedes is that he’s been able to sustain his heightened level of power this year by putting up a .251 ISO for the second consecutive season. The better news for Cespsedes, though, is that, in addition to strengthening an area in which he’d always shown some ability, he also demonstrated impressive improvement in an area of perceived weakness: walks and on-base percentage (OBP). 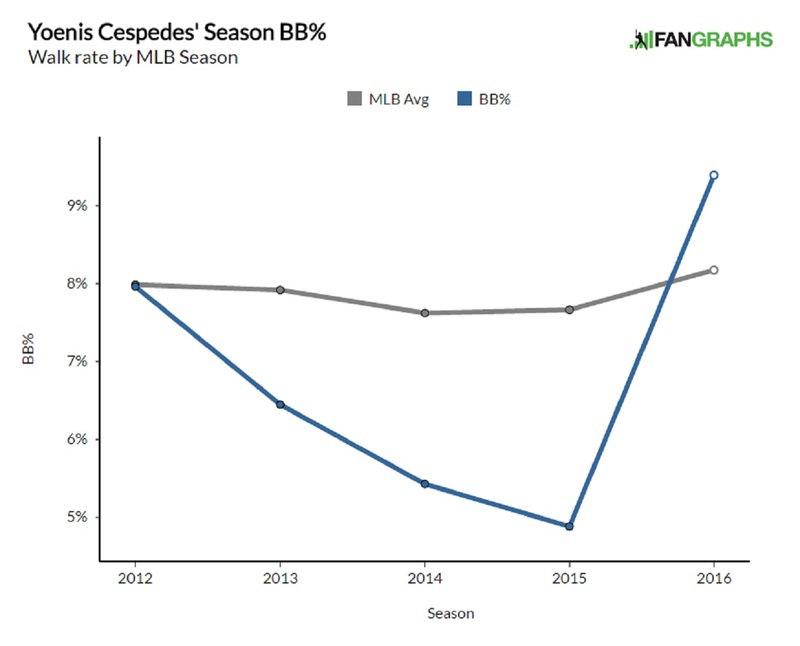 From 2013 to 2014, Cespedes’ OBP hovered around .300; last year it increased to .328 thanks in large part to the influx of home runs (and their effect on his batting average). This year, however, Cespedes brought his OBP up to .354, a level he hasn’t reached since he posted a .356 OBP in his rookie season. The obvious cause of this impressive boost has been a dramatic reversal in his walk-rate trend. In 2015, Cespedes’ walk rate bottomed out at 4.9%; this past year, it soared to a new career high of 9.4%. One of the key questions facing teams interested in signing Cespedes this winter, then, is whether the boost is real. It goes without saying that a player with good power and decent OBP will be worth more to a team than a player with good power and poor OBP. Which type of player should teams expect from Cespedes going forward? In baseball, it may not be possible to have too much of a good thing when it comes to quantity of elite-level players. The sport is, almost by definition, at its best when great players face off against one another. If there’s a problem with a strong collection of elite talent, though, it’s that truly great players can get overlooked. It’s hard to distinguish oneself when surrounded by an array of other distinguished performances. A look at the WAR leaderboard from the American League this past season reveals that four second basemen finished among the top 11 overall performers in the league by this metric. We know MVP finalist Jose Altuve was outstanding and we know Robinson Cano had an absolutely tremendous season in Seattle. Slightly less heralded was the overall performance of the Twins’ Brian Dozier, although his 28 homers in the second half still garnered him plenty of attention. But what about the fourth second baseman on the list? Did we pay enough attention to Ian Kinsler this year? Hammel signed a one-year deal with the Cubs prior to the 2014 season, was traded to Oakland with Jeff Samardzija in the Addison Russell trade that July, and then returned to the Cubs on what would’ve been a three-year, $30 million contract had the option been picked up, but which has instead become a two-year, $20 million deal. In his two-and-a-half seasons with Chicago, he pitched 446 innings to a 3.59 ERA, 22.9% strikeout rate, and 5.9 WAR – and added 0.6 WAR with the bat, for good measure. Now, those stats might be disappointing for a top-of-the-rotation pitcher, but Hammel was functionally the Cubs’ fifth starter! Fifth starters aren’t supposed to be this good and the Cubs could’ve had effectively retained him for $10 million (his $12 million option minus the $2 million buyout), so why didn’t they? The dominant storyline of this postseason is reliever usage — well, the dominant storyline aside from the length of championship droughts, at least. Cleveland manager Terry Francona has freed himself to use elite reliever Andrew Miller when necessary rather than constrain himself to such trivial guidelines as save opportunities. Miller’s success (and Francona’s resultant success) has led people to ask whether this is a watershed moment for standard relief pitcher usage. Has Francona made it acceptable to more closely align optimal reliever usage with leverage rather than inning? There are a few big reasons to think Miller’s 2016 postseason isn’t going to change bullpens as we know them. First of all, Miller’s contract status makes him immune from the reality that relief pitcher’s earnings are intimately tied to save totals. Like it or not, save totals are of real consequence to relief pitchers who aren’t already receiving hefty salaries. Secondly, managers can do things in the postseason that simply aren’t practical during the 162-game regular-season grind. As an example, consider: even though Francona has utilized Miller in a notably flexible relief-ace role ever since Cleveland acquired him from the Yankees at the end of July, Miller also entered a game in the sixth inning or earlier just once in his 26 regular-season appearances. In the postseason, however, he’s entered in the sixth or early in four of his nine outings. Perhaps the biggest reason, though, that Miller’s case is unlikely to cause any immediate radical changes in bullpen management, is one discussed by an aptly titled article at ESPN.com by Sam Miller: “Cody Allen makes the Andrew Miller experiment possible”. To avoid confusion (and the resultant mass hysteria) likely to be caused by their shared surname, we’ll refer to the illustrious writer as Sam, and continue referring to the pitcher as Miller. Sam rightfully points out that the mere existence of another elite reliever is what frees up Francona to utilize Miller in such unconventional ways. Although the ship has long since sailed on making Allen “the talk of this postseason”, we still can (and should) spend some time talking about the other elite reliever who’s helped to situate Cleveland one win away from their first championship in 68 years. Allen has pitched 11.2 innings this postseason — or, to put it another way, has recorded 35 outs. Of those 35 outs, 22 have been via the strikeout — giving him a positively obscene 17.0 K/9 rate. To put that in perspective, uber-reliever Miller is sporting a 15.4 K/9 this postseason and the only reliever ever to top 17.0 K/9 in a regular season is some guy named Aroldis Chapman, who reached 17.7 K/9 in 2014. Does Cleveland Even Need Danny Salazar? When looking at postseason matchups, the quickest and most natural thing on which to focus is the relative strength of each club’s starting rotation. About a month ago, I wrote about this tendency to get caught up in starting-pitching matchups during postseason overanalysis — in part because it’s something that I myself tend to overanalyze. Which is why I looked at Cleveland at the start of the postseason and gave them little chance to advance to the Division Series or, certainly, the World Series. Lesson learned. As expected, Cleveland’s bullpen has been simply tremendous. With just six earned runs allowed in 32.1 innings pitched, they’re sporting a 1.67 ERA. The significantly less expected development, though, is that the rotation has done a heckuva lot more than just keep the team competitive. The rotation as a whole has allowed a similarly impressive eight earned runs through 38.2 IP, giving that unit a tremendous 1.86 ERA. Obviously Corey Kluber has been a significant part of that success, but so too has Josh Tomlin’s three earned runs in 10.2 IP and Ryan Merritt’s delightfully shocking 4.1 shutout innings. The only starting pitcher for whom the bullpen has really been compelled to clean up is Trevor Bauer and his drone-afflicted pinky.